-- Shaped like a tiny Leica. This was the first and simplest version. It looks nearly the same as the model II, but says model I on the top. Two speeds of B and I (1/25) which are changed with a dial on the front of the camera. Despite the name the camera usess 17.5mm film. -- (1956) Looks nearly identical to the model I, but says model II on the top. This camera also was sold as the Gem 16 Model II and the Saica. Fixed-focus 25mm (f8.0) lens. Two speeds of B and I (1/25) which are changed with a dial on the front of the camera.. This is the most common model. Despite the name the camera usess 17.5mm film. -- (1956) Shaped like a tiny Leica. This camera also was sold as the Gem 16 Model II and the Kiku 16 Model II. Fixed-focus 25mm (f8.0) lens. Speeds of B and 1/25. -- (1956) You would think that with a name like Model II that there must have been a Model I -- but there wasn't. But then you would think that this camera uses 16mm film, and it doesn't do that either. 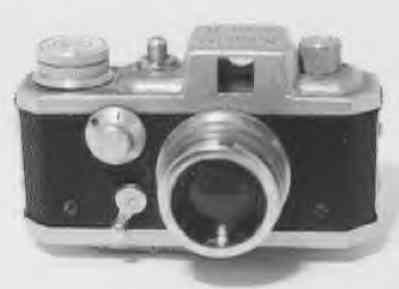 This camera also was sold as the Kiku 16 Model II and the Saica. Fixed-focus 25mm (f8.0) lens. Speeds of B and 1/25.